Exodus 15:11 Who among the gods is like you, LORD? Who is like you– majestic in holiness, awesome in glory, working wonders? I have been obsessed with the Holiness of God for this past year. I feel in my heart that until we try to understand as best as we can about the Holiness of God….we don’t get who God is and what our lives are really about. When Moses met God in the desert…God presented Himself as a burning bush to him. Moses had to take his shoes off because the bush and the area around the bush were so holy that it was disrespectful for Moses to even walk in that area with his shoes on. When God wants to show you who He is… He will show you His glory which I feel is the essence of His Holiness. When Adam and Eve sinned and God came down here to deal with them….He clothed them with animal skins and I believe they didn’t see a manifestation of God’s glorious nature. Why? Because they didn’t honor Him with obedience and holiness. They had sinned and needed a blood sacrifice. They were so disobedient that they were in no place to receive the blessing of experiencing holiness and glory of God. Moses needed to understand the Holiness of God because He was going to do mighty things for God in the future and he had favor. 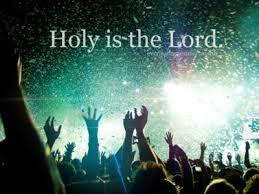 In order to have on ongoing and intimate relationship with God….you must understand His Holiness. 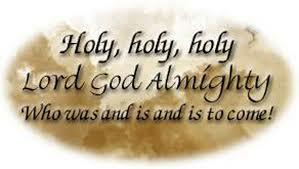 My meaning of the Holiness of God…. 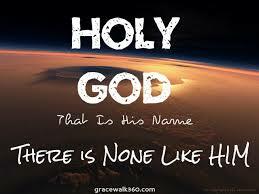 There is only one God because He is so unique that there is no other living perfect and holy being anywhere. He is the…I Am! He just… Is! He has no beginning and He has no end. God has no impure thoughts of any kind, no sinful actions, having an unexplainable purity that is so unexplainable that it is a total mystery to every human. God is separate from all mankind or any kind of being anywhere… in the past, now and forever. This kind of holiness is so unique that even the nature of God’s physical appearance is pure light… brighter than anything know to exist. He’s supernatural purity that requires preparation just to be in the presence of one so holy. This kind of holiness makes everything else without holy cleansing very filthy, dirty and utterly sinful. Mankind can never fully comprehend this kind of supernatural and powerful state of perfection. In all this explanation…it is still impossible to explain the mystery of God’s holiness…but the Holy Spirit will help you to be holy if you allow Him to do what He knows what to do in you. He will use the word of God to do this in your life. God’s holiness is truly incomprehensible to the unsaved and partly compensable to Christians. When I think of God’s Holiness…it represents to me who God is and why my relationship with Him depended on what Jesus Christ accomplished for me on the cross. I’m nowhere in God’s league except that I was made in His image. My heart and soul were far away from God until Jesus came along and saved me. I have the third person of the trinity living in me right now… but even so… that is not enough for me to be in God’s presence now. I still sin and need forgiveness. I’m not pure enough to be in God’s presence in my present body. 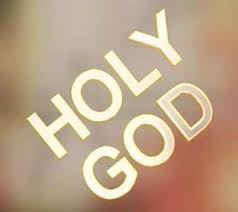 I will one day be able to be in God’s presence because Jesus made it possible for me to be presented ” faultless” before God and I WILL be able to stand before Him in all of His Glory, power ,majesty and……Holiness. Halleluiah!!!!! God’s Holiness is so mysterious that there really is no way for me to grasp the entire concept of it. I would not be able to function in this life if I fully understood it, because I would be ridden with guilt and fear from my sinful filthy heart. I am functioning now only because of Jesus and the Holy Spirit and because of the fact that I can feel Gods love for me. If it wasn’t for Jesus….my human life would be a crushing issue. It is a fact that I must deal with my actions but the truth is… in light of God’s Holiness… I know I must allow the Holy Spirit to help me balance my human nature and keep clean enough to live a righteous life here on earth. I think about who God is all the time. I try to look beyond the word God in my mind to see who He really is. By that I mean that there is the time about God before He created earth which is His eternal existence and His perfect holy nature. When I look past creation in that way… it is frightening to me because God’s a mysterious super powerful pure being. In the scope of my little mind…it’s amazing that there is something so out of my scope of earthly and human knowledge. I live in a dim lit world and He is…bright…light…perfection…extremely powerful…and without one bad though or deed, he’s sinless and pure. These words I used are really insulting to use about Him because they don’t come close to who He is and what His Holiness encompasses. If I really could comprehend this…I would never want to do anything that would go against His nature. I do though. I feel bad about it but I have forgiveness now because of Jesus and I know I will one day wear a white blood-washed robe. I know that I’m truly blessed to be this magnificent God’s child. If people understood about the Holiness of God… the first thing they would do would be to cry out for….mercy for their souls. The next thing they would do is to stop using His name so flippantly. This is what I did when I became a committed Christian. I was soooo sorry for everything I ever did wrong. I only use God’s name with the utmost respect now! God’s Holiness shines bright in light of my ungodly human nature. Because of the mystery of the Holiness of God…the world acts like they act because they don’t get God. They don’t get Him at all. Even people who say that they are Christians and still do lots of hurtful things to others…don’t get the Holiness of God. You can’t get God and still act really ugly or unholy. Our Father is….Holy….Jesus is ….Holy….and the third person in this Godhead is….The HOLY Spirit We must try to be like them….holy. What can we do to understand the Holiness of God? Well… the first thing is to read as much as possible what the bible says about God and what He requires of us. Talk to God a lot. Look around you…go outside…look up at the heavens and you will see how incredible God is. My best advice is to meditate on who God is. Ask God to help you to get the concept of His Holiness. You won’t understand it in His realm…but He will help you to get it like He did Moses. I doubt whether you’ll see a burning bush…but God has ways of getting knowledge to you because of the Holy Spirit. Even if you are NOT a Christian…God can and does communicate with you though the Holy Spirit trying to tell you truth either in your mind and or sending someone to speak to you. The mystery of The Holiness of God is something that is needed to be thought about… daily. We may not understand it all… but if we want to have an outpouring Of God….If we want a revival…if we want God’s blessing… then we need to be thinking about…”THE HOLINESS OF OUR GOD”.